Contamination of habitat is not always visible and may not cause immediate death of organisms that live in that habitat. Instead, contaminants may cause population-threatening, changes in the way an organism functions and reproduce in its environment. Toxic chemicals are thus a major long-term threat to biodiversity and may be an immediate threat to endangered species. The adverse impact of chemicals compromises the ecological character of wetlands, which are incompatible with the wise use concept of the Ramsar Convention on Wetlands. Tanzania is rich in wetland resources with an estimated 10% of the land surface covered by significant freshwater wetlands providing essential ecosystem and livelihood support functions. Millions of people depend on wetlands (MNRT, 2003) for fishing, agriculture, livestock keeping and collection of a multitude of minor wetland products, thus destroying the ecological functions of wetlands. Tanzania ratified to the Ramsar Convention on 2002, as a commitment to maintain the ecological character of its wetlands of international importance and to plan for the sustainable use of all other wetlands in the country. This convention stipulates wise use of wetland resources, maintaining the ecological character of the site while contributing to peoples livelihoods. The Kilombero Valley, designated in the same year, is among four Ramsar Sites in Tanzania. It covers surface of 7,967 km2 with a catchments area of about 40,000 km2. The valley is rich in endemic species of flora and fauna and characterized by high concentrations of large mammals especially Puku, Buffalo, Elephant, Hippopotamus and Lion. Over the last two decades human settlement in the valley has increased, parallel with the socio-economic activities such as livestock keeping, fishing, cultivation, and bee keeping. The agro-pastoralism, large and small scale cultivation of rice and sugar cane with an intensive application of diverse arrays of pesticides, is a major threat to this valley´s ecological integrity. Unlike changes resulting from human socio-economic developmental projects that are often obvious, adverse chemical impacts on wetlands are difficult to detect and evaluate due to number of different interacting reasons, e.g. unclear route of exposure, negative impacts of particular chemical pollutants that may be limited to the wetland vegetation or to specific faunal species, and chemical pollutants in wetlands often cause chronic rather than acute problems for the affected organisms, making detection more difficult. 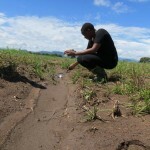 Since the information on the chemical contamination of Kilombero wetlands is lacking, it is anticipated that a detailed study needs to be done on the potential impact of toxic chemicals on ecological status of freshwater wetland ecosystems in Kilombero flood plain. Therefore, this study shall provide comprehensive information on the impact of toxic chemicals on the health status of the ecosystem. It will help in raising awareness towards the ecological and human-related dangers of excessive pesticide application, and develop management recommendations for a more efficient and less environmentally adverse use of agrochemicals. Assessment of Potential Effects of Agro-chemicals use in ecological status of Kilombero Flood Plain, Ramsar site –Tanzania: Poster, SETAC world Congress, 20-24 may 2012, Berlin, Germany.